A brief biographical account excerpted, and rearranged, from the Gleaner of August 8, 1939. R. J. deCordova may justly be considered to have been a Jamaican, for he was born in Kingston, December 15, 1824, and in his early career assisted in the publication of the Gleaner, his father being one of the founders. 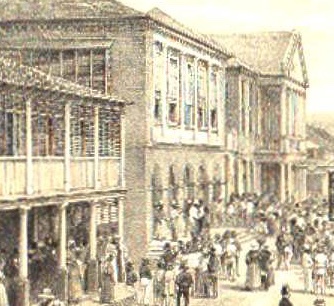 R. J. deCordova came to New York in 1848 and became manager of the large importing house of Aymar and Company. This business he managed for twenty-five years. Also he wrote the leaders for the New York Daily Times, attended to the foreign correspondence of Lauman and Remp, and from 1857 until 1890 he was the most noted humorous lecturer in the United States. His original humorous stories were, given in Boston, Philadelphia, and Chicago, and many other cities. He was offered $10,000 to deliver ten lectures in California. and the S.R.O. sign, or its Victorian equivalent, was usually necessary —- five hundred were turned away the evening he opened Steinway Hall in New York. He accumulated an extensive repertoire. He numbered among his friends many illustrious people. Among them was Kossuth, the Polish patriot; Garibaldi, the Italian patriot; Charles Dickens, the author. He was a patron of music in the 70's and Adelina Patti, the Shakashes, and Madam de la Grange were his friends. The late Mr. Rafael deCordova re-visited Jamaica many years ago and gave a series of lectures in Kingston. He was a brother of the late Mr. G. J . deCordova, who was the father of Mr. Michael deCordova, the present Managing Director of the "Gleaner" Company Ltd. The lecture of Mr. R. J. De Cordova last evening was more largely attended than many of its predecessors of the course have been. But it was an interesting story. It described the call of the Rev. Mr. Trot to the pastorate of one of the churches of Turnipdale. It told of the enthusiasm of his reception; of the admiration excited by his sermons; of the views entertained of hypocrisy by Mrs. Deacon Hubbins, as expressed at that lady's tea-party. It told of the great 'Squire Upham, who lived in the big house, owned the big factory, through it managed the village and ostracised from society all who opposed him in anything; how Mr. Upham thought it his privilege to "run" the minister as well as the flock, inasmuch as he paid the largest part of the salary. It described the devotion, and the ostentatious presents sent by the different members of the congregation, hams and turnips and barrels of pork; and contrasted these with the modest present sent by the Mr. Jacobs, an overcoat, which did not have the name of the donor attached. Then it recounted the disgust of Upham, the ‘Squire, when Rev. 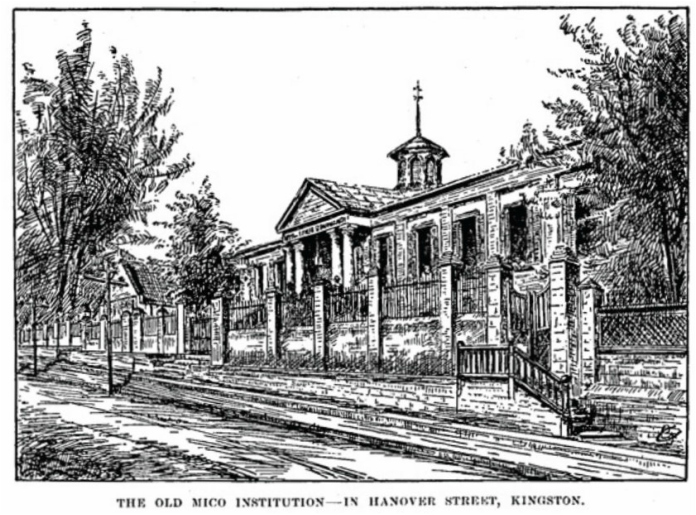 Trot, in response to a request from that magnate to preach a sermon against the strikers in his mills, asked “who is right," and his subsequent successful endeavours to frown down the minister who dared ask such a question, refusing to pay anything towards his salary: discountenancing his presence in society; and leading the rest of the elders and magistrates in the church to do likewise. Then it told of Billy Upham'« visits to Maud Trot, and the ‘Squire’s command to discontinue them, which, having failed, he sent Billy off to New York, to engage in business, where he failed and involved his father in his own ruin. It then had a fortune descend to the Rev. Trot, who hired the Squire’s house and went off into all kinds of extravagant follies, until he was obliged to call on his old friend Jacobs to straighten out matters for him. With his wealth, fresh popularity came to the clergyman, and to ‘his daughter came back Billy Upham, fresh from a stay in Europe. Billy’s efforts at serenading were Iudicrously described, and finally peace and joy settled down on the whole lot. DeCordova told this story, which of itself was interesting, with a gusto of manner that added greatly to its effect. The text was a scathing arraignment of the hypocrisy and undue influence which are brought to bear on a pastor to blunt his powers of usefulness and to harden his heart. It was a capital lecture. 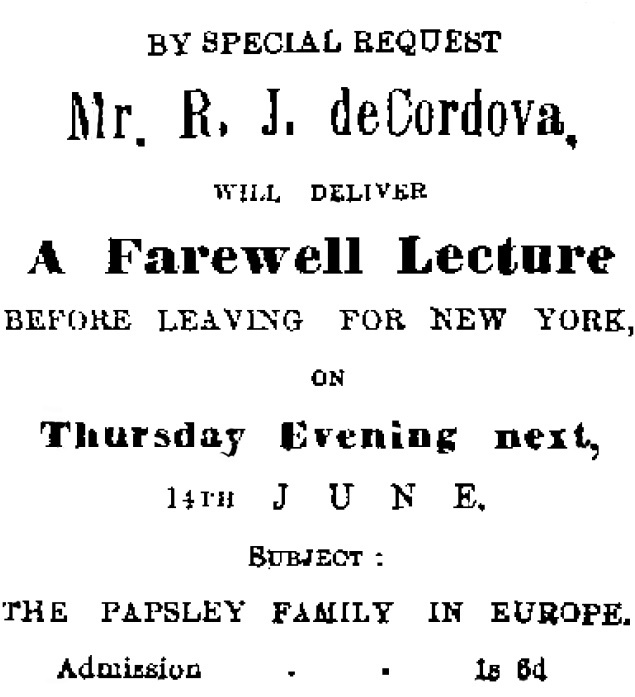 In the s s Alvo from New York: -- Mr. R. J. DeCordova; Mr. W. J. Pierce; Mr. John Hope; Mr. William Winer; Mr. William Barley; Mr. William Collins. the Town Hall, upstairs the building in the centre, on Harbour Street, with the Court House to the right of the picture. Last evening, pursuant to advertisement, Mr. R. J. de Cordova delivered his lecture at the Town Hall to an appreciative audience. The Hon. William Malabre presided, and the lecturer treated his subject in that masterly and humorous manner for which he is so popular with American audiences.